Whether you're an IT professional, a partner or a consultant, the Microsoft Assessment and Planning (MAP) Toolkit 4.0 helps you understand your organization's IT infrastructures and determine the right Microsoft technologies for your needs. This free Solution Accelerator can quickly inventory small or large IT environments without requiring you to install any agent software in your environment. The data and analysis provided by MAP simplifies the planning process for a wide range of discovery, readiness and server consolidation projects. In July 2009, the Solution Accelerators team released the latest version of MAP, which is available from the Microsoft Download Center at go.microsoft.com/fwlink/?LinkID=157858. This release includes new assessments for Windows 7 and Windows Server 2008 R2 readiness, an improved performance metrics collection engine and new configuration settings that help you customize your server virtualization planning efforts. This article describes how the new Windows 7 and Windows Server 2008 R2 readiness assessments can help you move your organization's existing computers to these new operating systems and explains how MAP can help you plan for consolidating your existing physical servers with virtualization. To assist in the planning for a migration of existing Windows-based computers to Windows 7, MAP provides a readiness scenario to help assess which computers are capable of running Windows 7. After the environment scan has been completed, MAP looks at computers running earlier versions of Windows, such as Windows XP and Windows Vista, and compares CPU speed, memory and free disk attributes to the minimum and recommended system requirements. When a computer doesn't meet a specific requirement, such as that for installed memory, MAP provides a specific recommendation that indicates what action is required to bring the machine to the recommended level. The Inventory Summary section indicates how successful the MAP inventory has been. It shows counts of computers that are running client or server operating systems as well as counts of those where not enough data was collected to make a determination. The Before Hardware Upgrades section displays the Windows 7 readiness results of the environment as inventoried. Computers considered "Ready for Windows 7" are those that meet or exceed the Minimum Ready hardware requirements for CPU, memory and free disk available. Computers identified as "Not Windows 7 Ready" don't meet the Minimum Ready system requirements but could be brought up to minimum levels by increasing the installed memory or the free disk available. A computer identified as "Cannot Run Windows 7" typically has a CPU that lacks the power to run the OS. "Insufficient Data" means that a computer wasn't found or couldn't be inventoried. 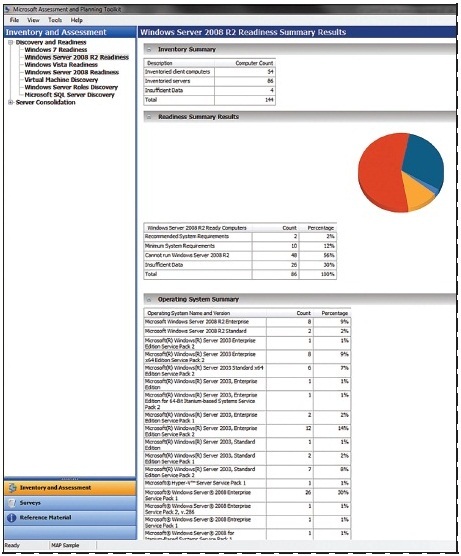 The Client Assessment worksheet in the Windows 7 Assessment detailed report provides computer-by-computer readiness information, including whether the computer was successfully inventoried, basic hardware information, the current Windows 7 readiness level (minimum, recommended), detailed hardware upgrade information if an upgrade is required and any device compatibility issues identified for that computer. The After Hardware Upgrades section displays your environment's Windows 7 readiness if all the recommended hardware upgrades provided in the detailed assessment report are implemented. The Device Compatibility Summary shows the results of the hardware device analysis. Each discovered device, such as a printer or an external hard drive, is analyzed to determine whether a device driver is provided on the Windows 7 DVD, is available from Microsoft Update, is available from the device manufacturer's Web site or requires you to contact the device manufacturer to determine compatibility. The numbers in this summary can give you a sense of the compatibility issues you could face in your migration efforts. The device driver compatibility information MAP uses is updated frequently. Be sure to use the Check for Updates feature available on the Reference Material tab regularly to ensure that your assessment is using the most current information. You can decrease each property to as low as the minimum requirements allow or increase each to as high as the environment requires. Being able to customize the settings gives you the flexibility to determine readiness according to your preferred system requirements and the needs of your desktop users. After you've determined the appropriate settings for the environment or gone through several iterations to find the best hardware configuration, you can change the settings to the desired values and click Run Assessment. MAP analyzes the inventory information based on these new settings and updates the assessment results in a matter of minutes. In addition to the summary results in the user interface, MAP provides printable summary and detailed reports to support your organization's planning efforts. You can create these preformatted reports by using the Generate Report/Proposal task from the Actions pane on the Windows 7 Readiness Summary Results page or from the Prepare New Reports and Proposals wizard available from the File menu. For the Windows 7 readiness scenario, the detailed report is a Microsoft Excel workbook that provides the assessment results. Worksheets include those summarizing the environment's readiness for Windows 7, the assessment properties used in the analysis, computer-by-computer assessment results, summary and detailed information about device driver compatibility, hardware upgrades required for each computer to bring it to Minimum and Recommended Ready levels and a list of all applications discovered on client computers during the inventory process. 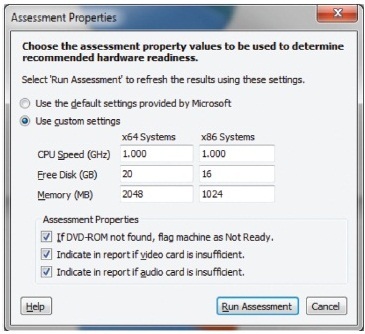 The Windows 7 Readiness Assessment Summary Report is a Microsoft Word document that provides a printable version of the assessment results displayed in the user interface. New in this release is the ability to customize the content provided in the summary report. With this feature, partners and consultants can use the presentation-ready charts and graphs supplied in conjunction with their own text, recommendations, marketing message or branding. For information on how to customize and co-brand the toolkit, see https://partner.microsoft.com/40114089. New to MAP 4.0 is an assessment that helps you in the discovery and inventory of server computers and assesses the readiness of these computers for Windows Server 2008 R2. Much like the Windows 7 scenario, MAP looks at the CPU speed, installed memory and free disk available to determine whether each computer currently meets the minimum or recommended requirements for system readiness. Because the Windows Server 2008 R2 release can run only on x64-compatible hardware, MAP also looks at inventoried attributes of the CPU to determine whether it is compatible with this OS. The Inventory Summary and Device Compatibility sections provide similar information for servers as the Windows 7 scenario displays for clients. In the Readiness Summary Results section, the server environment's readiness for Windows Server 2008 R2 is summarized into four categories. MAP uses two sets of system requirements to determine a server's readiness -- minimum and recommended -- just as in Windows Server 2008. Servers that meet these requirements are included in the Minimum System Requirements and Recommended System Requirements categories, respectively. Computers that can't run Windows Server 2008 because of insufficient hardware or because they're determined to be x86 are listed in the "Cannot run Windows Server 2008 R2"category. MAP includes any computers that couldn't be inventoried as well as computers for which any of the required attributes couldn't be determined in the Insufficient Data category. The Operating System Summary section provides the distribution of server operating systems in the IT environment. You can use these results along with the upgrade path information found at tinyurl.com/n6tr7j to determine whether an in-place upgrade or flatten and rebuild strategy best suits your migration project's needs. 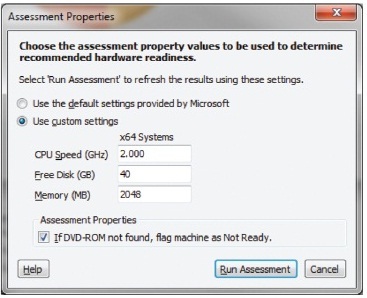 The Set Assessment Properties feature is also available for the Windows Server 2008 R2 assessment. Selecting the Set Assessment Properties task from the Action pane on the Windows Server 2008 R2 Readiness Summary Results page brings up the Assessment Properties dialog box shown in Figure 4, in which you can adjust the values MAP uses to identify servers that meet the Recommended System Requirements. These values include CPU Speed, Free Disk space and installed Memory. As in the Windows 7 assessment, you can adjust these values to reflect the needs of your environment. Once you've set these values, you can use the data already collected to update the results by clicking Run Assessment. 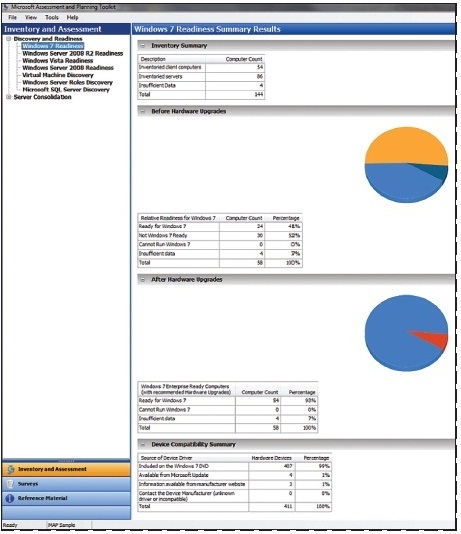 The detailed printable report that accompanies the Windows Server 2008 R2 assessment provides a summary of the environment's readiness, computer-by-computer assessment results that call out any hardware deficiencies, a detailed inventory of the physical and virtual server environment, summary and detailed information about device driver compatibility and a list of applications found on those servers. The easiest way to identify servers for consolidation is to run the Inventory and Assessment Wizard first. This wizard allows you to configure how MAP should discover computers, as well as provides the local administrator credentials needed to inventory the computers that MAP has cataloged. After this task is complete, you can review the results for the Windows Server 2008 R2 Readiness Assessment to find out whether the inventory was successful. The Server Inventory worksheet on the detailed readiness report identifies any computers that weren't successfully inventoried. If you require a more complete inventory, you can review the "Preparing Your Environment" section in the Getting Started Guide, address any connectivity or credential issues and rerun the Inventory and Assessment Wizard. After the required inventory results have been achieved, you can again use the Server Inventory worksheet to create a target list of computers for which you want to collect performance metrics. Just copy the values from the Computer Name column, paste them into a text file and save the file to use in the next step. Before the Server Consolidation Wizard is enabled, MAP requires you to use the Performance Metrics Wizard to collect the performance counters it uses in making placement recommendations. In this wizard, you identify the target computers using the text file you saved in the preceding step, provide local administrator credentials to allow MAP to connect to those machines and specify the duration of the metrics collection. The Performance Metrics Wizard gathers information about the CPU, memory, disk and network utilization of each identified computer. It collects performance counters from each machine in five-minute intervals. The number of computers from which MAP can successfully collect performance counter data depends on factors such as network latency and server responsiveness. If you need to collect performance data for a large number of computers, you should split the target computers into batches of up to 150 computers. MAP can provide better consolidation recommendations if peak utilization data is gathered. Follow the guidance provided in the Getting Started Guide to optimize the use of MAP in this scenario. trics have been collected, you can view the results in the MAP console. Assessment properties such as collection success rate, CPU, memory, network and disk utilization for each computer are available on MAP's Performance Metrics Results page. You can determine potential consolidation candidates by reviewing the Performance Metric Results worksheet. In addition to collection activity results, this report provides detailed processor, memory, network, physical -- as well as logical -- disk inventory and utilization results. If the results are satisfactory, you can use the values under the Computer Name column in any of the worksheets to copy the consolidation candidate computer names into a text file for use in the next step. Run the Performance Metrics Wizard again if you need additional servers or collection samples. The final step in generating server consolidation recommendations is to produce a host machine configuration and identify the list of servers to be considered for consolidation. In the Server Consolidation Wizard, you can select the virtualization technology to be used; provide specific CPU, storage, network adapter and memory configurations; adjust guest reserves for memory and physical disk; and generate MAP recommendations. If you're going to perform several iterations without setting a new host configuration every time or work consistently with several known configurations, you can create a hardware library to streamline your work. 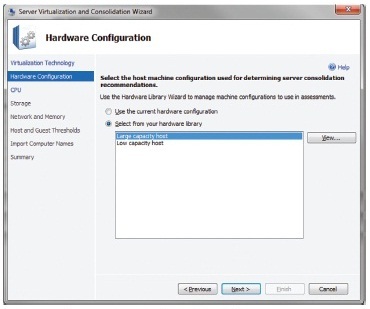 The Hardware Library Wizard lets you preset named instances of host configurations. You can find this wizard in the Tools menu. The wizard provides forms for CPU, storage, network adapter and memory configuration in addition to allowing you to name, edit and delete existing hardware library entries. After being saved, these configurations are available for use in the Server Virtualization and Consolidation Wizard, as is shown in Figure 5. You can then quickly generate recommendations using these saved instances. After the server placement recommendations are complete, you can review the results in the MAP console from the Server Consolidation Summary Results page, which is shown in Figure 6, as well as in the detailed information provided in the accompanying report. In the MAP console, the recommendations are summarized in four sections. 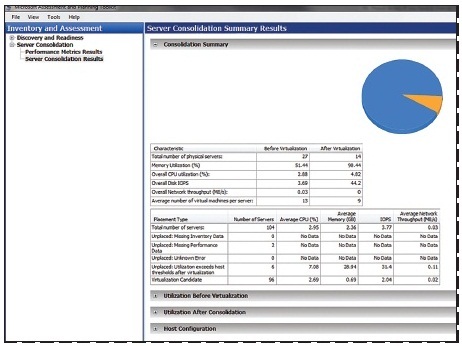 The Consolidation Summary section provides a pie chart that shows how many servers were successfully placed, an aggregated comparison of the performance counters for consolidated servers before virtualization and the projected performance metrics for the physical host machine with the virtual machines in place. The Utilization Before Virtualization and Utilization After Consolidation sections show the key performance counter information collected for each machine before consolidation and the projected utilization after consolidation for each new host machine. The Host Configuration section displays the host configuration and the host/guest threshold values used in the assessment. The Server Virtualization Recommendations report provides the host machine configuration details, a plan for which physical machines should be consolidated together and the measured utilization of the consolidated computers before virtualization. To understand why a new host machine was needed, review the Last Placement Failed Reason column on the Consolidation Recommendations worksheet. Before you finish the virtualization planning process, you should use the Microsoft Virtualization ROI calculator to determine the total cost of ownership and return on investment (ROI). When MAP generates the Server Virtualization Recommendations, it also provides an XML file containing the results of the analysis. You can use this file to estimate ROI using Microsoft virtualization solutions. See the Integrated Virtualization ROI Calculator page at tinyurl.com/kmtfl4 for more information.